Considering A Home Automation System? Ask These 10 Questions First! Have you considered home automation? Do you find the idea of a smart home attractive and effective? You’re not alone. Millions of Americans across the nation are making the switch to smart homes in an effort to make their lives easier and to save money on utility bills. Especially in California, energy prices are volatile and continue to climb. As a homeowner in Sacramento, you may be thinking about installing a smart home system to achieve these two goals. In this post, we’ll share ten questions to ask before purchasing the best home automation system to fit your needs. 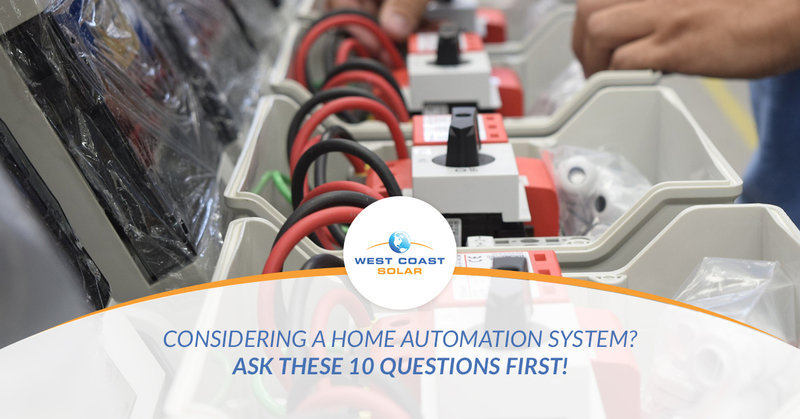 If you’re interested in finding a company that helps with smart home technology installation, give West Coast Solar a call today! Otherwise, continue reading to learn more. Question #1 – What’s Your Goal For Home Automation? Do you want to brag to your neighbors and friends that you can lock your house, turn the lights off, and throw a steak on the grill with the tap of your phone, or do you want to save energy, help the environment, and make your life easier? In most cases, you can have both! It’s important to understand what you want to achieve with home automation before installing it, so you can effectively conquer that goal with little to no conflict. Question #2 – Where Do You Begin? Components. Installers. Budget. It’s all involved in purchasing a smart home system, but which one is priority number one? At West Coast Solar, we would suggest you start with a budget. What can you pay every month? What can you afford to spend up front? What do you expect to save by using smart home technology? The other aspects of this purchase should fall into place as you discuss the budget portion, which will lead you to which system to buy, when to buy it, and how to buy it. Question #3 – Will You Need To Build A New House To Use Smart Home Technology? The short answer is no; however, there are some exceptions to this answer. In most cases, any home can have smart home technology installed. The older the home, the more extensive the installation may need to be. Nonetheless, if you want smart home technology, there’s a way to get it installed in your home. Question #4 – Do You Need To Replace Your Appliances Or Electronics? You may need to replace smaller components, but if you have modern electronics, smart home technology should be able to connect/work with it. This is a great question to discuss with your home automation installer. Question #5 – Is Home Automation Tech Difficult To Understand? Not really. Smart home technology is simply digitizing manual tasks like changing the climate in your home using your phone instead of your thermostat. Imagine lying in bed and wanting to make the room cooler. You can grab your phone, open an app, and change the temperature of any room in the house (if your HVAC allows this) without ever getting out from under the covers. Many other appliances and electronics allow for this type of use, too! Question #6 – Will Smart Home Tech Cost More To Use? Once your smart home tech is installed, it will actually cost less to use than your traditional system. Take your air conditioner, for example. Smart home tech can manage and adjust your climate as the external temperature changes; it will also adjust according to settings you input to match your lifestyle. The money saved with home automation will help you more efficiently use energy in your home. Question #7 – Will Home Automation Tech Be Compatible With Security Systems? Great question! For the most part, home automation and smart home tech can interact with currently installed security systems; however, if there is a discrepancy, you may need to install a home automation/smart home system that can work with your security system to effectively use both. You may need to update your security system, too. Question #8 – Can You Access Home Automation Remotely? Yes. You will be able to access our smart home remotely through your phone, computer, or tablet. This means you can lock the doors, change the home climate, or check in on the kids with cameras from anywhere with an internet connection. Question #9 – Will Home Automation Change My Lifestyle? Yes, it will make it better! When you don’t have to worry about the house being secured after you leave for work, forgetting to turn off the ac, or energy costs for leaving the lights on all weekend, you will spend more mental energy doing the things you love. Question #10 – Will Current Home Automation Tech Advanced With Future Tech? Home automation systems will advance alongside future technology as it’s developed. Smart home technology is developed with the future in mind, so if you decided to buy a new stove that you can talk to, your system should be able to accommodate it. Nonetheless, it’s always best to discuss this question with both manufacturers to confirm compatibility. As technology advances into the future, so should home automation systems. Smart home tech will follow suit, since it’s developed with the future in mind. Nonetheless, if you’re looking for home automation installers, give West Coast Solar a call today!